Solar Tracker Market size for 2016 was valued over USD 7 billion and is set to exceed an annual installation of 70 GW by 2024. Paradigm shift in line with large scale integration of renewable energy resources coupled with favorable regulatory measures towards the outspread adoption of solar technology will proliferate the global solar tracker market size. Provision of leveraging schemes, fiscal incentives, tax credits, rebates and soft loans along with consequent re-structuring of the existing electrical infrastructure will further complement the business outlook. The solar industry in the recent years, subject to the ambitious renewable targets abided by the nations across the globe has witnessed appreciable amplification. Rapid deployment of solar systems to sustain an effective energy mix across the consummate power sector will stimulate the solar tracker market growth. In addition, rising concerns pertaining to curb emissions from conventional plants will comprehensively thrust industry size. Declining component cost along with growing adoption of high efficiency systems will augment the solar tracker market share. Expeditious adoption of economies of scale favored by fall in financing costs have instigated a competitive business scenario. Thereby, falling component costs further lead to a sustainable decline in the overall tariff structure of the generating stations which in turns complement the business growth. Single axis solar tracker market share is predicted to witness growth owing to its appreciable cost effectiveness when compared with available alternatives. Although the product instigates a higher capital and operational expenditure, however delivers an effective electrical output which will further sustain the product demand. Dual axis solar tracker market size for 2016 was valued over USD 2 billion. Product flexibility to track in both vertical and horizontal axis helps in maximum utilization of the sunlight and thereby, attains prime applicability across utility aided installations. PV solar tracker market is set to witness a growth over 16% by 2024. 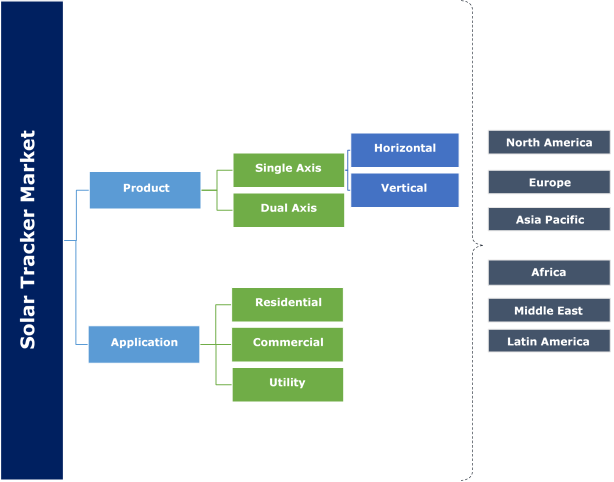 Ease of installation, competitive cost structure and compact size of photovoltaic technology are few indispensable parameters evaluated to justify the product penetration. Rapid adoption of these systems across residential, commercial and industrial establishments to cater the exponentially increasing energy demand will further stimulate the product demand. Rapid urbanization coupled with increasing infrastructural investments will positively impact the residential solar tracker market. Favorable government norms pertaining to renewable integration including FIT, subsidies, and leveraging schemes to encourage its deployment across residential establishments will comprehensively thrust the product demand. In 2017, regulators across China revised their solar FIT mechanism for PV and distributed PV installations. The provision lays benefits worth USD 0.14/kWh, and USD 0.06/kWh for respective installations. 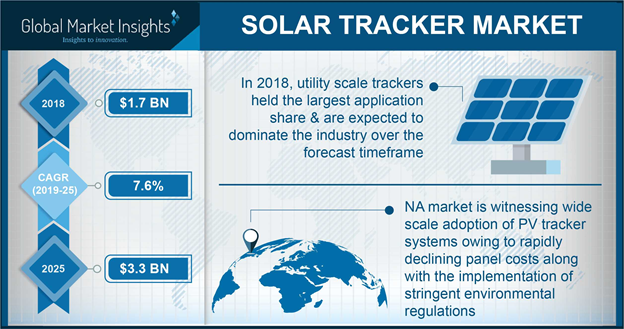 Utility applications in 2016 accounted for over 80% of the global solar tracker market share. Increasing demand for grid connected electricity networks across urban areas coupled with rapid integration of smart monitoring technologies across developed regions will complement the industry outlook. The U.S. solar tracker market is projected to reach over 12 GW by 2024. Regulatory measures to reduce fossil fuel dependence along with the favorable financial mechanism to encourage deployment of renewable technologies will stimulate the product penetration. Rising investments to overlay the existing conventional plants with clean energy technologies will further embellish the business landscape. In 2017, regulators across the U.S. have proposed reduction in its broad tax reforms through lowering corporate taxes with an aim to escalate the clean energy industry dynamics. Germany solar tracker market is anticipated to witness a growth over 19% by 2024. Increasing investments toward clean energy technologies along with introduction of long-term objectives to reduce carbon footprints will propel the demand of solar tracker in the country. In Germany, market premium scheme lays favorable mechanism for the ease of adoption and financial assistance to supplement renewable based installations. Hence, favorable reforms coupled with increasing consumer awareness in line with renewable energy integration will further escalate the product demand. Increasing infrastructure development along with growing electricity demand will augment the China solar tracker market share. Rising investments to diversify clean energy portfolio coupled with stringent norms pertaining to GHG emissions will further complement the regional business growth. In 2015, China invested around USD 110.5 billion towards the expansion of renewable. The manufacturers are investing in R&D to maximize the overall efficiency. For instance, in 2016, NEXTracker has launched solar plus storage solution which increases product energy efficiency by integrating tracker, battery, inverter, and software to provide better return on investment to plant owner. Trackers improves the energy output by orienting modules toward the sun. It follows the sun movement in both horizontal and vertical direction. The product helps in minimizing the incidence angle between incoming sunlight and solar panel, which improves the amount of electricity produced. The tracker helps in increasing power output by 10% to 25% as compared to stationary or fixed-tilt system depending on tracking system geographic location.